I’m related to a pioneer pilot, Archibald “Arch” Hoxsey. After the Wright Brothers flew at Kitty Hawk, North Carolina they started a flight school and Arch was one of their first four graduates. 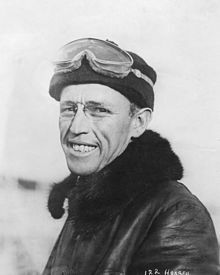 He was considered in his time to be the most daring of professional aviators. “Arch was my grandmother’s 2nd cousin several times removed,” my Aunt Marjorie would tells me when reflecting on our great grandmother. “He was one of the Wright brothers’ first 5 students. Incidentally,” she adds, “Teddy R. was the first American President to fly in an airplane, and his pilot was Archie.” Hoxey set the American record for sustained flight across country, making the non-stop 190 mile flight from Springfield Illinois to Clayton, Missouri on October 6th 1910. From Clayton, he took former US President Roosevelt for a flight in nearby St. Louis. The flight is recorded in a silent movie – courtesy of The Library of Congress Motion Picture, Broadcasting and Recorded Sound Division. Imagine the technology 100 years ago when you watch this barnstorming video — I wonder if Roosevelt blew chunks In my mind, it makes Arch Hoxey the first pilot of “Air Force One”. 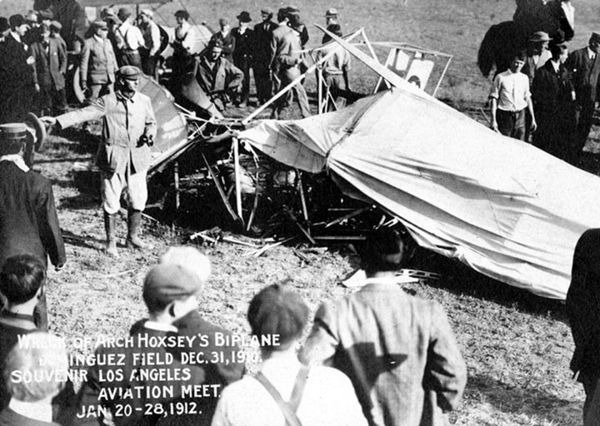 It’s too bad that within ninety days of this historic flight, Hoxsey’s adventurous life ended. 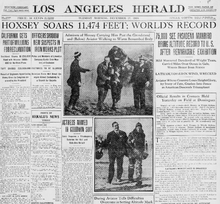 In that brief time he also set the world’s altitude record, flying his airplane to 11,474 feet, He died 3 days later on December 31, 1910 “… when returning to earth in a series of perilous glides.” As you could see from that video, every flight looked like a “perilous glide” to me. His crash site is documented in this photo published almost a month after the event. In his short but exciting life, Arch was a bonafide celebrity in airshows and traveled extensively with the Wright brothers. Interestingly, the most famous early aviators (John Moisant, Ralph Johnstone, Charles Hamilton and Arch Hoxsey) were among the celebrities pictured on a media called “tobacco cards” that were distributed with packs of cigarettes in 1910-11. These cards were part of an interesting series called “Champion Athletes and Prizefighters” which competed directly with baseball cards from that era. Archie Hoxsey flew most often with Ralph Johnston and together they were known as “The Stardust Twins” — filling newspapers with race reports, breath taking contests and adventure.